From June 16 to 19, 1963, Valentina Vladimirovna Tereshkova became the first woman to fly in space. Tereshkova was born on March 6, 1937, in the village of Masslenikovo. Her parents worked on a collective farm, but her father was killed during World War II. While working at a textile mill at the age of 18, she took correspondence courses from an industrial school and joined a club for parachutists, making over 150 jumps. 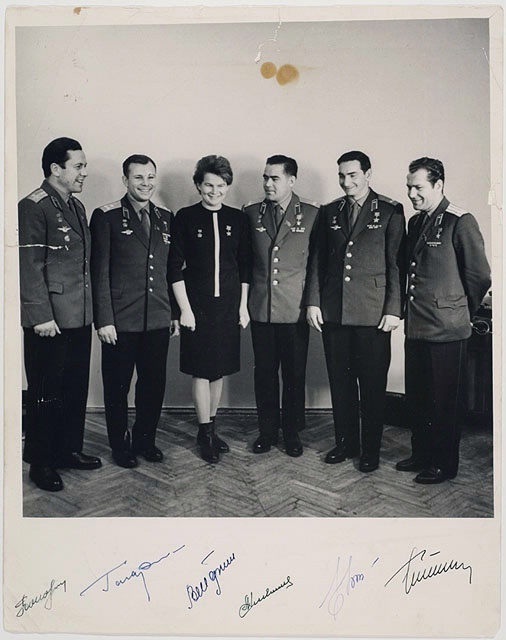 Shortly after the flight of cosmonaut Gherman Titov in September of 1961 she wrote a letter to the space center volunteering for the cosmonaut team. Unknown to her, Soviet space officials were considering the selection of a group of women parachutists. In December 1961 Valentina was invited to Moscow for an interview and medical examination. The following March she reported with three other women to the Soviet Space Center at Star City. The women were subjected to the same centrifuge rides and zero-G flights as male cosmonauts. They were also commissioned as junior lieutenants in the Soviet Air Force and given fight instruction. In May 1963, Tershkova and Tatyana Torchillova were chosen to train for the Vostok 6 flight. On June 16, 1963, she was launched into orbit aboard Vostok and made 45 revolutions around the earth in a 70-hour 50-minute space flight. Tereshkova orbited the earth once every 88 minutes by operating her spacecraft with manual controls. Tereshkova parachuted from the Vostok 6 after re-entering the earth's atmosphere and landed about 612 km (380 miles) northeast of Karaganda, Kazakhstan, in central Asia. In the years following her flight, she made many public appearances and trips to other countries. Tereshkova went on to graduate from the Zhuykosky Air Force Engineering Academy in 1969 and earned a degree in Technical Science in 1976.